It’s radish season at the farmers market, aka the early season. Those candy-colored spice-balls are not for everyone, but if you cook them with bacon, 000they will mellow. 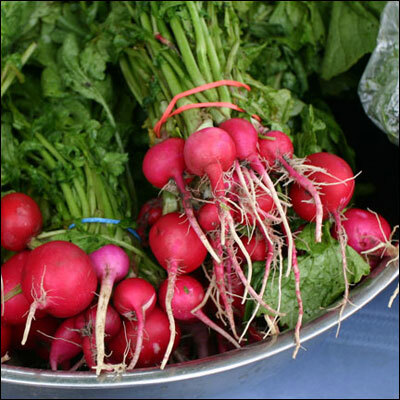 And not all radishes for sale these days are caustic; there are some mild and sweet options, too. What the early season markets lack in diversity of produce, they make up for in possibility. Now is the time to buy potted plants for the garden. If it’s the fruits of summer you’re after—the tomatoes, corn and green chile—you might want to check back in a few months. But if you’re willing to put down that latte and get physical with the earth, you’re right on schedule. Last Saturday I checked in on what I consider to be the two big local markets on that day: Downtown Albuquerque and Los Ranchos. I was on the hunt for tomato and basil plants, as well as select cucurbits, like melons, cucumbers and hopefully a few calabacitas, which I had meant to start from seed but hadn’t gotten to yet. That Saturday morning I woke up fearing it was too late. Each market has its own character. Some are more horticulturally focused, with an older, quieter clientele, while others are more festival-ish. On Saturdays, one can choose from either extreme. In the early season, when the crops are young and the mornings are chilly, the year is full of possibility. The farmers look refreshed after their hibernation. You run into people that you may not have seen since last fall and discover who reproduced without telling you. The Los Ranchos Growers’ Market, at 6718 Rio Grande NW, next to the fire station, is the Saturday option for those who want to get their plant materials and go home. This one starts at 7am, and the vendors and customers are largely focused on the greenery. This isn’t to say that there isn’t festivity, music even, only that the guitar guy isn’t playing in front of a sea of undulating, half-naked revelers like what happens at your other Saturday market option. The Downtown Growers Market, on the corner of Central and 8th, is at the freak show end of the spectrum. And you can arrive a bit later in the morning. This extravaganza is part farmers market, part craft fair, part downtown ABQ and part Grateful Dead show parking lot. Veterans of this market will notice a reorganization this year. The eastern end of Robinson Park is fenced off, and the market has expended into the park’s western end, which has a cute mini-plaza. This market has always been a place where local entrepreneurs can test drive their business models, and every year you see a new crop of folks giving something a try. This year, pickled asparagus and beans courtesy of Valley Gurlz Goodz. I also snagged some Armenian cucumber starts, as well as my favorite tamale in ABQ: one of Mary and Tara Benavidez’ Santa Domingo burrito-sized, Pueblo style green chile and calabacitas tamales. Speaking of calabacitas, I found no young plants, but a strong consensus among the growers at market was it’s not too late to plant calabacita seeds. Multiple growers even suggested that planting calabacita seeds in June might help you end-run around the squash bugs.